Identity Access Management (IAM) is an authoritative association of people with identifiers such as ID numbers and ID cards, access credentials such as usernames/passwords and authorization to access data and services. Identity Access Management is fundamental for providing access to university services. Your UFID number is your unique University identification number. This automatically generated, eight-digit number identifies you for all services at UF. You will have only one UFID. Your GatorLink ID (username and password) is defined by you. This is the credentials that you will use to access all UF services. It is associated with your UFID but is used for access to digital services versus identification. Your UF email address may be similar to your GatorLink username, but they are not the same. Your email address is not a substitute for your GatorLink ID. 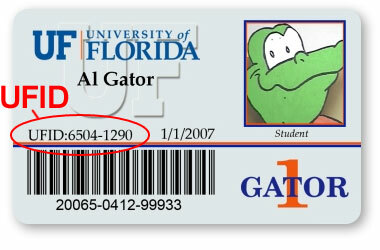 Gator1 ID card is a printed Identification card used to identify you on campus. It displays your UFID number directly above the barcode.